The anatomical interpretation of the surface of the lateral side of the hip is made difficult not only related to frequently excessive amounts of subcutaneous fat tissue but also due to the fact that the underlying anatomy needs to be well understood. Fig. 1: Under condition of back-inclination of the hip, the trochanter is located under the tensor fasciae lata and may not produce any mark at all allowing its identification. Fig. 2: Backwards rotation of the femur and/or forward inclination of the pelvis move the trochanter out from beneath the tensor fasciae lata and the iliac tract, producing a clear recognizable mark. The best way to identify the trochanter mayor is by placing a finger while moving hip and femur forth and back. 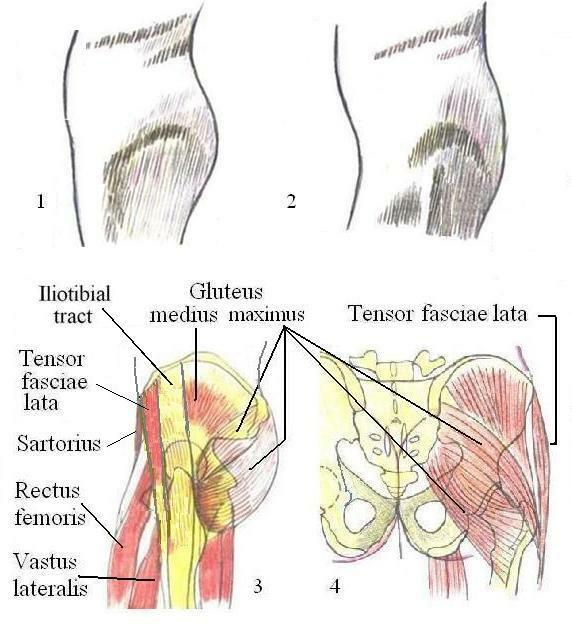 Figures 3 and 4: Note especially: The upper part of the gluteus maximus connects predominately to the trochanter mayor, and the lower part mainly to the part of the femur adjectant below.